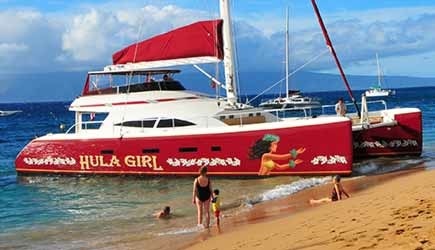 Maui’s newest and most luxurious sailing catamaran, the 65′ Hula Girl is truly state-of-the-art. From her teak accents and comfortable seating on the foredeck … to the VIP lounge and hi-tech navigation station on the flybridge … this multi-million dollar custom catamaran will just make you say “wow.” The Hula Girl Sunset Cruises offers two different sailing excursions … she was conceived as a “high quality restaurant and bar that sails.” All food and beverages are ordered from their menu … and appetizers and entrees are prepared to order by the Hula Girl’s chef in their on-board commercial kitchen. Prices are reasonable … appetizers range from $3 to $24and beverages are $2 to $3 and cocktails are $6 to $8, beers are $3 to $5. Wines are available by the glass or the bottle $8, $25. The focus of this excursion is high tech sailing in West Maui’s tradewinds. Hula Girl is decked out with Spectra racing sails, and offers luxury and comfort from bow to stern with cushioned deck seating. Feel free to join the Captain on the Fly Bridge with panoramic views and couch seating! Beverages, cocktails, appetizers, and lite dinner fare available for purchase. Keiki menu available as well. Check out the Sunset Sail Menu! Schedule: Monday, Wednesday, and Friday from 5pm-7pm (Spring-Summer) and 4:30pm-6:30pm (Fall). Extended, upscale dinner cruise … Start the evening with a cruise along the scenic West Maui coastline to beautiful Kapalua. Hula Girl will ancho there in the calm protected cove at the Cliff House. Their professional onboard chefs create an extensive Pacific Rim ala carte menu, using only the freshest local ingredients. Choose from appetizers and entrees such as Chef’s daily fresh fish special, Filet Mignon served with a Porchini White Truffle Demi Sauce and Mash Potatoes, or the melt in your mouth Cabernet Short Ribs with Mashed Molokai Sweet Potatoes topped with Crispy Maui Onions. Dinner service is from 5-6pm, and every table has an ocean view. While the Captain and crew set the sails for the smooth downwind run back to Ka’anapali, enjoy one of their sumptuous desserts. Check out the Dinner Cruise Menu! And they recently added a Rack of Lamb entree. For dessert lovers, the pastry chef Sela Smith bakes delicious Pineapple Upside Down Cakes, and will soon add a Mayer Lemon Cake with Strawberry Compote. Schedule: Tuesday, Thursday, Saturday, and Sunday from 4pm-7pm. Restrictions: This activity is not accessible by wheelchair or walker. This is a barefoot cruise, and participants walk across the sand and sometimes get their feet wet while boarding. Guests must have a valid picture ID for alcoholic beverages, regardless of age. Note: The Hula Girl departs from Kaanapali Beach; guests take off their shoes and walk through the sand. You will likely get your feet wet (and maybe your ankles and occassionally your knees) when you board the vessel. NCL Pride of America cruise ship passengers who come into Kahului are able to do the 2 Hula Girl 2 hour sunset but it does require a rental car as the drive to Lahaina takes a little under an hour. 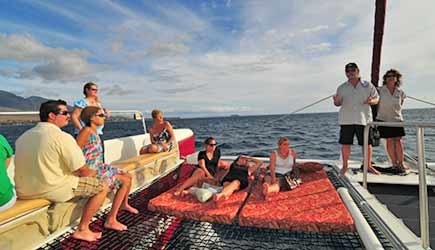 Lahaina cruise ship passengers can do this tour on their first day in port with a short cab ride to Kaanapali as long as your tenders are running until 8pm. The Hula Girl is great if you’re staying in Kaanapali and it’s hard to imagine a more stunning vessel on which to hold a dinner cruise. Everything about this boat is first class, and they are the only one that actually has a fully-functioning kitchen on board. This cruise is different though, as the price you pay to go out on the boat just admits you on board. You still have to order your food and beverages off a menu. The price of their food and beverages is reasonable though, so if you aren’t real “cost conscious” and more concerned about a spectacular experience, then this is a great way to go. Another Kaanapali option is Teralani Sailing. For guests who would like to depart from Lahaina we recommend Pride of Maui or Maui Princess.